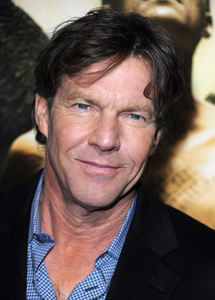 Hollywood A-lister Dennis Quaid is not just another actor turned rock star, he is a rock star! With more than 100 films under his belt, including the latest I Can Only Imagine, Quaid still finds time to tour with his band Dennis Quaid and the Sharks, performing in front of thousands of people each year and receiving rave reviews. The band has gained great popularity for their rock 'n' roll / country-soul sound. As the lead singer and rhythm guitarist, Quaid and the band perform original songs and classic hits such as “Spill the Wine”, “Gloria”, and many more. The band even throws a Jerry Lee Lewis song or two in the mix, including “Great Balls of Fire," which Quaid performed in the film of the same name when he played “the Killer” in the 1989 biopic. Don’t miss Dennis Quaid and the Sharks on Saturday, July 14 at 8pm at The Ridgefield Playhouse, part of Pepsi Rock Series powered by Xfinity with support from Bow Tie Cinemas. Opening act for the show is Marc Von Em, former guitarist for Matchbox Twenty. Make it a great night out with dinner and a show: visit Eddie’s Pizza and Pasta(24 Prospect Street, Ridgefield) the night of the show and enjoy a complimentary glass of house wine with your entree when tickets are presented. Media sponsor for the night is i95FM, the Home of Rock and Roll. The origins of Dennis Quaid and The Sharks can be traced to one night when Quaid went to see actor Harry Dean Stanton and his longtime band (appropriately named the Harry Dean Stanton Band) perform at an L.A. club. Quaid was invited to join the band onstage. At first reluctant because of his decade-long layoff from music, Quaid finally did perform with the band and was successful enough that Jamie James, a member of Stanton’s band, approached Quaid about starting a group of their own. James quickly began recruiting others for the band and it wasn’t long before Dennis Quaid and the Sharks, which specializes in “rock ‘n’ roll and country-soul,” was performing at L.A. clubs. Quaid got his start in acting with the 1979 film Breaking Away, but it was his role as astronaut Gordon Cooper in The Right Stuff that propelled him to stardom. Since then he has taken on many notable roles such as Doc Holliday in the film Wyatt Earp (1994) Nick Parker in the remake of The Parent Trap (1998) a married closeted gay man living in 1950s America Far From Heaven (2002) for which he won the New York Film Critics Circle Award for Best Supporting Actor, and many others. As successful as Quaid’s acting career has been, his passion and talent for rock music is undeniable! Kicking off the night is the former guitarist from Matchbox Twenty, Marc Von Em, a soulfully energized singer and musician whose sound flows easily between blues, folk & funk. With three independent releases, Von Em has worked his way up through coffee houses and bars to prestigious bills shared with such artists as Martin Sexton, Richie Havens, Glenn Tillbrook and others. He still tours regularly as a guitarist with Matchbox Twenty’s Rob Thomas. For tickets ($75 | Meet and Greet additional $75), call the box office at 203-438-5795, or visit ridgefieldplayhouse.org. The Ridgefield Playhouse is a non-profit performing arts center located at 80 East Ridge, parallel to Main Street, Ridgefield, CT.